Charlotte held its town meeting today, and passed overwhelmingly Article 10, the resolution to urge Congress to overturn the Citizens United vs. the Federal Election Commission decision of the Supreme court. An article authorizing the construction of sidewalks in the west village area was also approved in a close paper-ballot vote, 102 - 94. A resolution of the Vermont House, H.C.R. 288, congratulating Charlotte on the 250th anniversary of its charter by New Hampshire Governor Benning Wentworth on June 24th, 1762, was read by Town Moderator Jerry Schwarz. The resolution was offered by Representative Mike Yantachka, who presented a copy to the Selectboard and to the Town Clerk. Rep. Yantachka spoke about the legislature's response to tropical storm Irene and the Vermont Strong commemorative license plate that is available through the DMV for $25. Funds raised from sales of the plate go toward Irene flood relief. 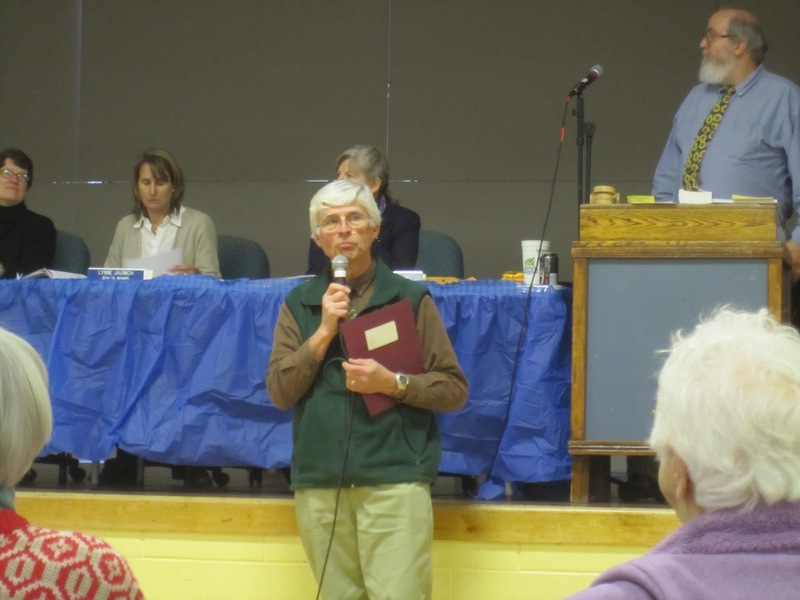 Yantachka also provided copies of his 2012 Legislative Town Meeting Report, a summary of the work done by the Vermont House since the session started in January, as well as the annual Doyle Poll survey. For those interested, a similar online survey by Rep. Sam Young is available at http://www.repsamyoung.com. Update 3/7/2012: The CCS and CVU school budgets both passed easily.